[1 March 2012] -- A new toolkit on the case research method for urban planning is earning appreciation from urban planners in cities across Africa. 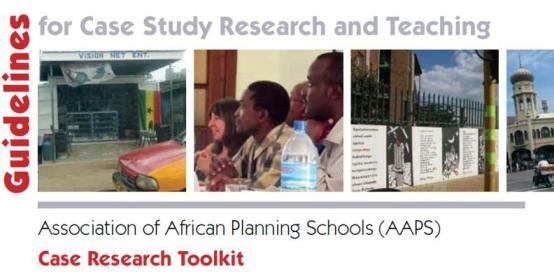 Developed by the Cities Alliance’s partner Association of African Planning Schools (AAPS), the toolkit offers a step-by-step guide on the case research method, a lesser-used technique for urban planning within the region. Also known as the case study method, it is a technique whereby a case is examined in detail using specific research tools such as explorative interviews, observation and document analysis. The research is typically done over time and is highly contextual. A related concept is comparative case research in which researchers compare two or more cases relevant to a particular research question. In a departure from the norm, this toolkit is locally developed - quite unlike urban planning research methods that historically originated from the global North. Odendaal says, “We are playing with the idea that different conceptions of planning can be formulated from the ground up by drawing on good, rigorous, in-depth case study research.” This becomes particularly important in the African context where urban systems are highly complex and influenced by different post-colonial experiences. Designed for urban planning students, researchers, teachers and practitioners, the AAPS toolkit includes an online resource document and an interactive CD. It synthesises the content and learning outcomes of three AAPS workshops on case research held in Dar es Salaam, Johannesburg and Accra in 2010. Currently, the toolkit is being circulated extensively among urban planning schools across Africa and the AAPS is optimistic that it will soon be adopted by planners in other developing regions of the world. The AAPS is a peer-to-peer network administered by the African Centre for Cities and mainly comprises of Anglophone African universities from 15 member countries that teach urban and regional planning. The Cities Alliance is supporting the AAPS, in partnership with the Alliance’s member Shack/Slum Dwellers International, to enhance the quality and quantity of urban research and planning professionals in Africa so they can better respond to challenges posed by rapid urbanisation in the region over the coming decades.